A new paper published in ApJ which is now making a number of headlines. 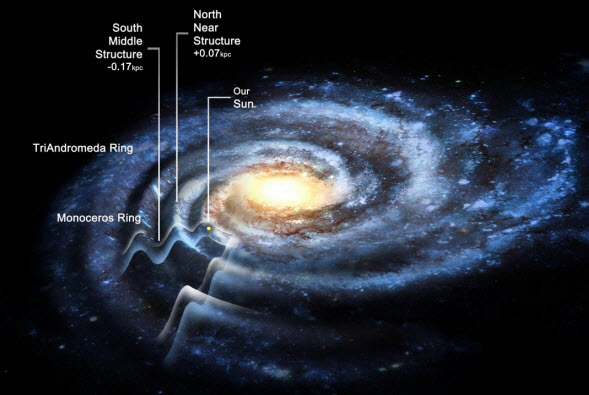 The tl;dr is that what had previously been thought to be a ring of material outside of the established edge of our galaxy's disk (the "Monoceros Ring") is actually just a continuation of the standard disk, but which wasn't fully apparent because the disk actually oscillates above and below the plane in a wavy pattern, so we were only seeing part of the full picture. This also means that the stellar disk does not drop off at ~15kpc as previously thought, but actually extends up to ~25kpc. Detecting this structure required making detailed star counts across several slices of sky (via Sloan data) and using some simple but clever analytical techniques. Basically, if the disk is symmetrical about the horizontal plane, (i.e. the disk is flat) then you would expect to see roughly the same number of stars north of the plane at a given distance as you would to the south. Therefore if you make a color-magnitude plot of stars to the north and subtract it from a similar plot taken to the south, the two should cancel and leave you with a blank image. Any asymmetry will instead show up as a residual. What the team found by using Sloan data is that there is indeed an asymmetry, and that it switches back and forth (north-->south-->north) and grows larger with distance. The cause of this oscillation is thought to be perturbations from our satellite dwarf galaxies.